You can actually experience the feel of driving a truck from the 7 major European truck manufacturers such as MAN. You will be in charge of delivering cargo between 18 German cities that are connected by the major highways. You can choose from 60 different loads to carry. You start your new career as an employee of a cargo transportation company and if you work hard enough you can gain the respect and buy your own truck, which will allow you to start your own trucking business. You will be able to purchase garages while setting up your branch offices throughout Germany. You will of course need to upgrade your trucks and ensure maintenance is performed when necessary. 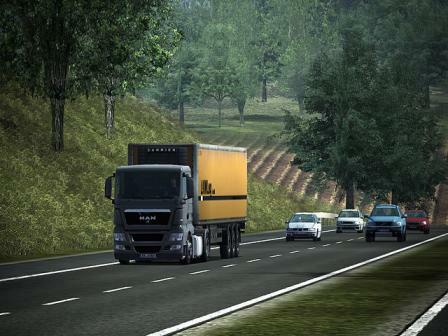 The drive is realistic as you travel across the countryside and visit all the authentic cities of Germany.